A pterygium is a triangular shaped growth of tissue on the inside of the white of the eye. In extreme cases it can gradually grow large enough to cover the pupil which can blur or obstruct vision. 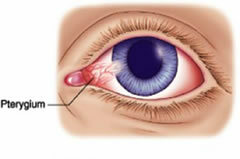 Pterygium can affect one or both eyes. It is more common in people between the ages of 20-40, and more prominent in males. Exposure to ultraviolet rays from the sun is thought to play a major role in the development of a pterygium. There are also some cosmetic issues associated with a pterygium. A person may feel uncomfortable about the appearance of the eye, which may initially motivate them to seek treatment. If there is a suggestion that the pterygium is growing across the cornea or causing other problems it is best to have it surgically removed to avoid complications and loss of vision. 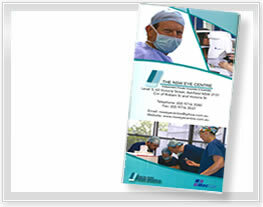 Pterygium surgery is a day only procedure usually performed under local anaesthetic with a light sedation. 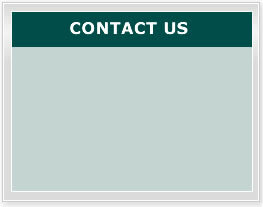 Your surgeon will make a small cut in the conjunctiva surrounding the pterygium enabling the entire growth to be removed. To reduce the risk of re-growth a conjunctival autograft can be used.